which help me to constantly scalp in my profits. 1. Use the trading system on any currency pair you like. 2. Timeframe for main screen is M1. TP is 12 pips, SL is 45 pips. I've set slower moving pairs to TP 7 also, depends on your expectations. The higher the timeframe, the more profit you may want to take. 3. Eventually use a second backup screen for higher semafor check on M15/M30, but get your feeling. but I work without that. It would of course give even more safety. been detected, that is the yellow one with a red circle around it. least over 70% in one direction, the higher the better. lines blue and green. If it is in them or even past, get ready. 7. 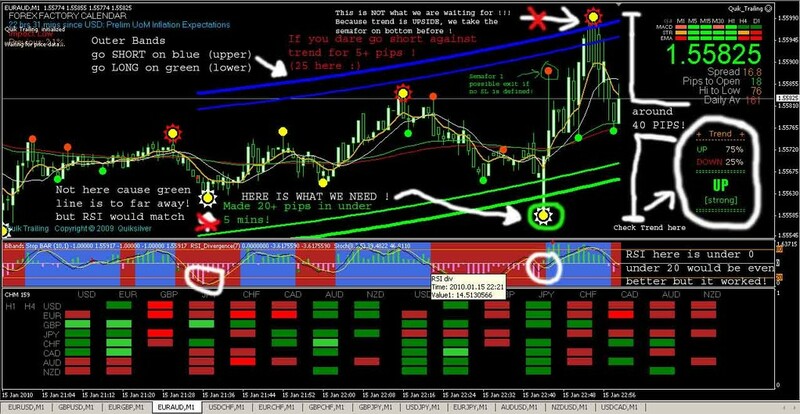 Check the RSI black and yellow line in the middle indicator on screen. candle after another, always marking highest of a trend. I have a special way catching trades ... but BEWARE OF HIGH RISK HERE, check money management !!! If a trade goes against my entry, I will re-enter with some martingale element. Meaning I check the daily average movement of a pair, take 50% and divide this by 3. Around 300 pips average /2 = 150, 150 / 3 = 50. Thus I reenter with double lot size 0.2 at -50 pips of the first trade. 9. For further confirmation of trends check the currency heat indicator at bottom. I use this system on more than 10 pairs at once with a bankroll of around 5k EUR.